My Thanksgiving usually consists of my boyfriend and I going out to dinner or ordering a ton of takeout and binge-watching Holiday movies. But since we’re not able to make it back to our home states like a lot of our friends, we’ll host a brunch the following weekend. It’s the ideal way to celebrate the start of the holiday season. 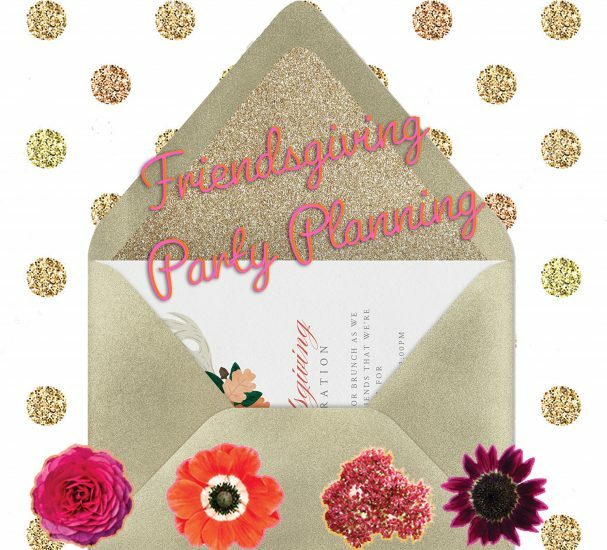 Here is my Friendsgiving guide with tips, tricks, and party planning ideas on how to throw a memorable gathering. Ask your guests beforehand when it is the most convenient time to have your gathering. The best options would be the weekend after Thanksgiving or on Thanksgiving night. Greenvelope offers free customizable evites that you can send with the click of a button. I love this idea when you’re pressed for time. Create an account and choose a template that best fits your theme. Next, edit your evite and add in all the details. Then, pick the envelope style and color, add the email addresses, and hit send! It’s that simple. A gathering isn’t a hit without excellent food. I love the thought of doing something more creative for my menu. A pizza bar with an impressive wine pairing is enticing. Another option I love is hosting a brunch with a donut bar complete with apple cider sangria. If you prefer more of a traditional Thanksgiving menu, here are my favorite recipes. 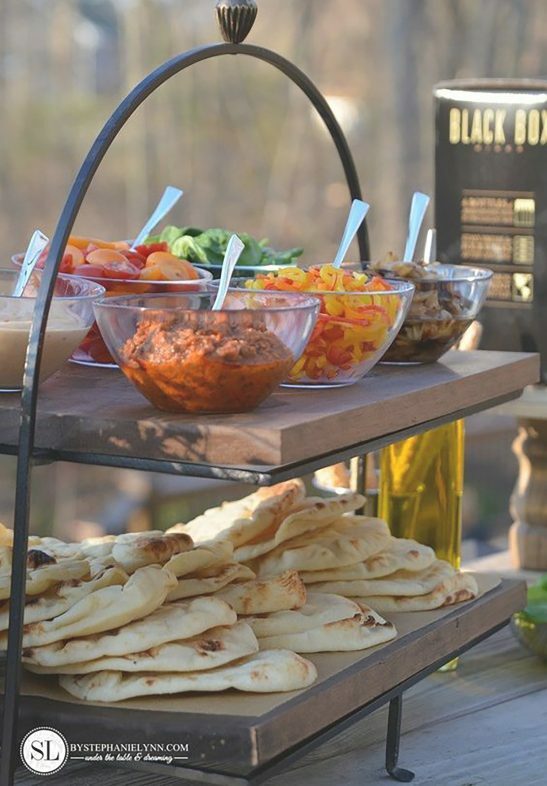 Planning a pizza bar with a mixture of toppings to choose from is such a fun (and tasty) idea. Before my guests show up, I’ll let the sauce simmer on the stove and prepare the dough so it’s ready to pop in the oven. I’ll fill up bowls with toppings and set out on a buffet style table. For meats I like to keep it simple and serve grilled chicken, pepperoni, and bacon. For cheeses I’ll set out mozzarella, parmesan, and vegan cheese. When it comes to vegetables and fruits, I’ll display a variety with different colors and textures. I’ll choose arugula, mushrooms, red onions, caramelized onions, jalapeño, olives, pineapple, garlic, and roasted tomatoes. I also include things like anchovies, truffle oil, garlic aioli, crushed red pepper, fresh oregano, rosemary, and sea salt. The goal is for my friends to get creative and have fun, so I like to have a lot of options to choose from. White: Champagne, Riesling, Italian Prosecco and Vinho Verde, Pinot Grigio and Sauvignon Blanc. Red: Pinot noir, Merlot, Cabernet Sauvignon, Aglianico, Sangiovese, and Zinfandel. A donut bar is perfect if you’re hosting a Friendsgiving brunch. 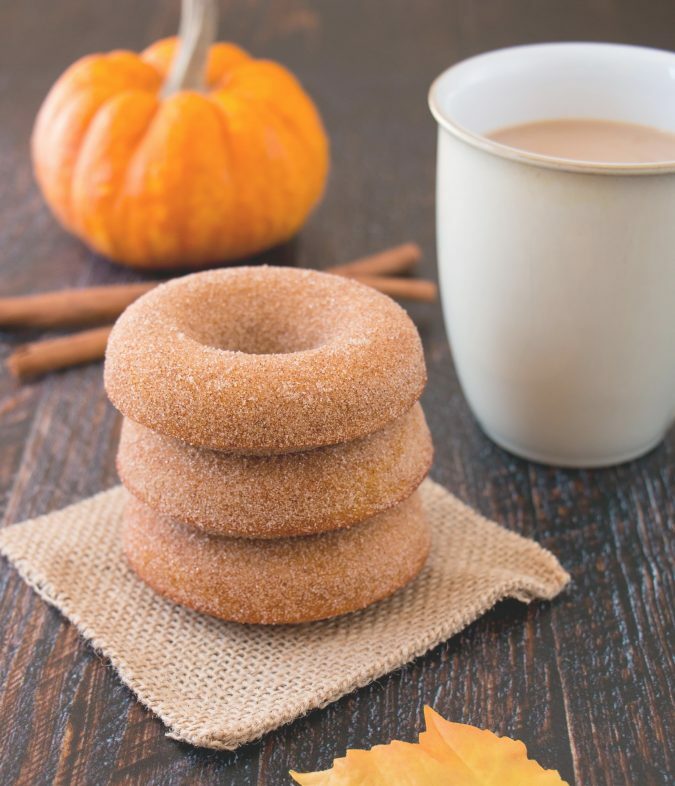 These pumpkin spice donuts from Little Sweet Baker are so addicting and they’re always a hit. I‘ll have the batter ready and once guests arrive I‘ll put in the oven for 15 minutes. When they come out I‘ll serve them warm and encourage everyone to put their favorite toppings on. I’ll put out things like cinnamon, sugar, nutmeg, nuts, caramel, sprinkles, warm apples, and ice cream (from Salt & Straw). I’ll also make homemade whipped cream and sauces like chocolate and salted caramel. Apple cider sangria, Serendipity’s Frozen Hot Chocolate, fresh pressed juices, Rosé, Prosecco, lattes, or craft beer. Envision the style and theme of your get-together and think about what look you’re going for; cozy, elegant, minimalistic or trendy. For inspiration I’ll check out Pinterest but I somehow always come back to the color of gold with elegant accents. It’s warm, chic, and classic. I’ll check to see what I already have and if it‘s cohesive with my theme. I‘ll organize a checklist of what I need or look to see if anything needs to be replaced. I’ll make my purchases based off my list. Pick one or two colors and work around them. Don’t put out dinnerware that is chipped or scratched. You don’t have to invest a ton of money. Check to see what you already have before purchasing anything new. 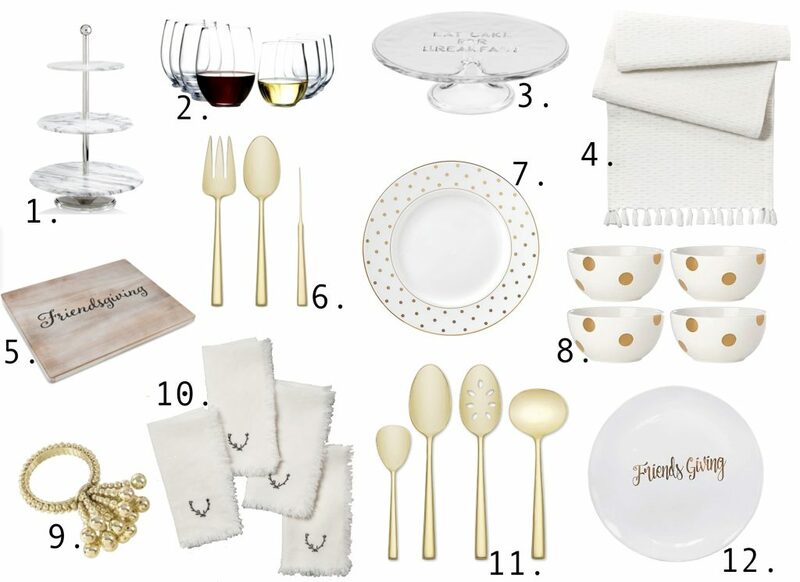 Target has festive and inexpensive plates, glasses, table linens, and accents. If you are going to splurge, buy dinnerware that isn’t limited to Thanksgiving. 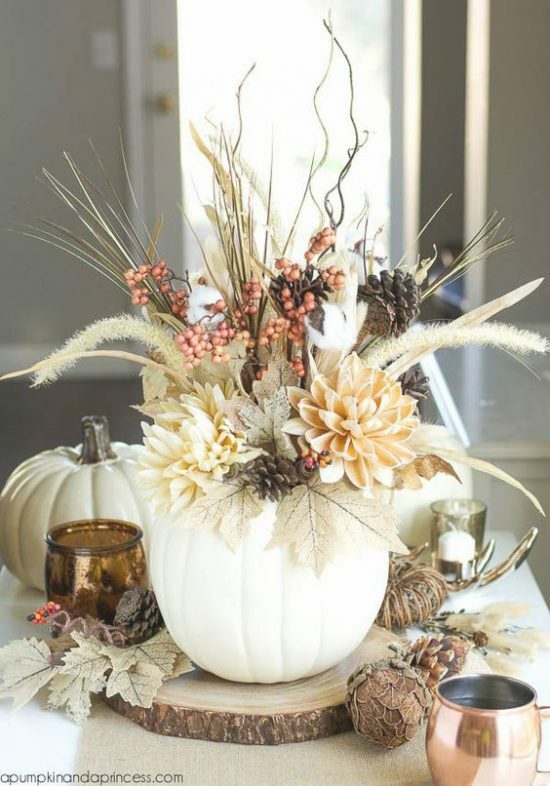 A great fall themed centerpiece adds such a charming touch and can brighten up any table. I like to choose one that invokes the warm autumn colors and adds a little sparkle. I’ll put out a simple, clear vase, and purchase fresh autumn flowers in rich hues. When I put my arrangement together I’ll include, orange gerberas, calla lily, aster, dianthus, violas., and then I’ll include a few fall related decorations around it like. If you‘re in a rush, save time by purchasing a prearranged bouquet at either your local farmers’ market or grocery store. To set the mood of my gathering, I’ll have the aroma of my favorites fall candle drifting through my kitchen and living room. This is my last chance to use my autumn candles because right after I switch to Holiday scents. I’ll display Feu de Bois by Diptyque, which smells like a fireplace, or I’ll put out an assortment of candles that’s scents blend well together. If you’re putting out more than one candle, be sure they are in the same scent family; sweet, spicy, floral, and outdoors. Don’t mix and match, it will become overpowering. If you’re gathering is in a small space use one large scented candle. You can still get the effect of multiple candles burning by displaying unscented votives throughout your place. 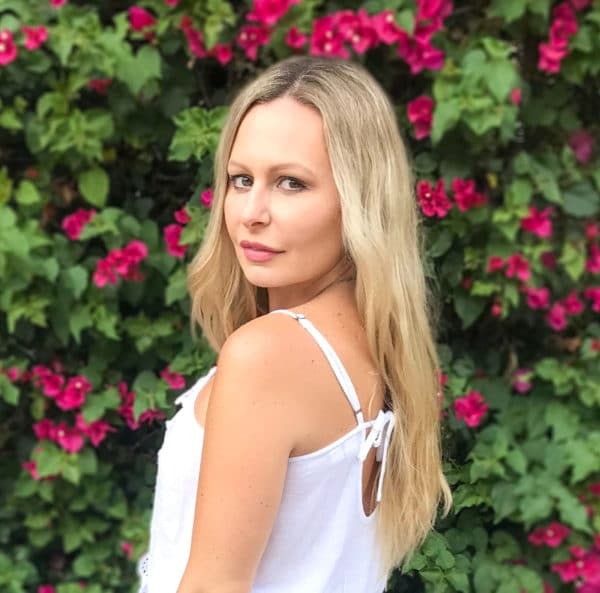 Spotify features tons of pre-made playlists but when I’m hosting a party or a gathering, I make it a priority to create my own. I’ll choose songs that I want to reflect the mood of my party. I’m a huge fan of hip hop and electronic music, but when it comes to a Friendsgiving, I stick to more classic and mellow songs that speak of friendship. It’s been a tradition of mine since I was a child to binge-watch Holiday classics while eating leftovers. Over the years my choices of films have changed but there’s a few that remain as my favorites. I’ll have these films downloaded in my library and ask my guests to vote on which ones they’d like to watch. If I’m hosting a boozy Friendsgiving, I’ll create a Holiday movie drinking game. If you’re attending a Friendsgiving this year, never go to your hostesses house empty handed. I love gifts that I can use the following morning like a basket of muffins or scones. There are so many options to choose from. You can never go wrong with gift baskets, a cookbook, coasters, succulents, or fancy chocolates. I like to send my guests on their way with to-go boxes full of the tasty food that was served. 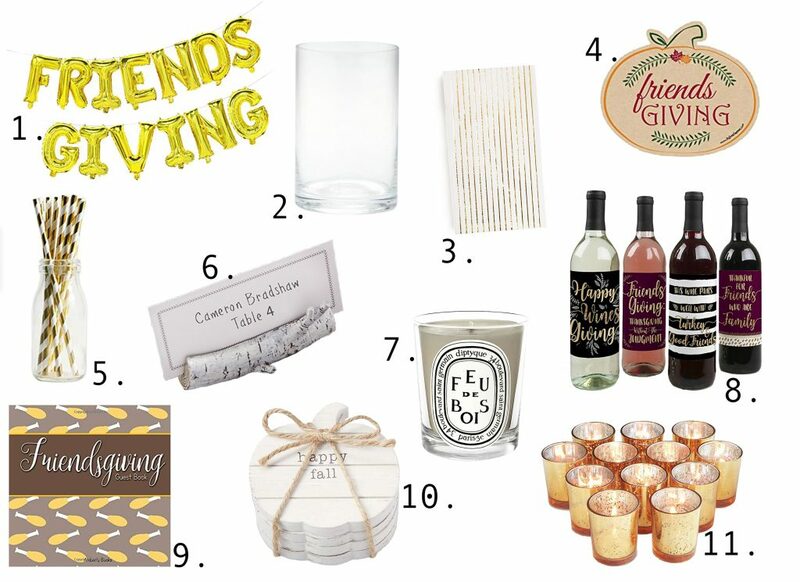 Over the years I’ve shown my appreciation by gifting them a frame and a candle that both said Friendsgiving on it. Have an instant camera and tons of film on hand. Pass the camera around and let your guests take selfies, photos of their food and photos of each other. What are your Thanksgiving / Friendsgiving traditions? Comment below! 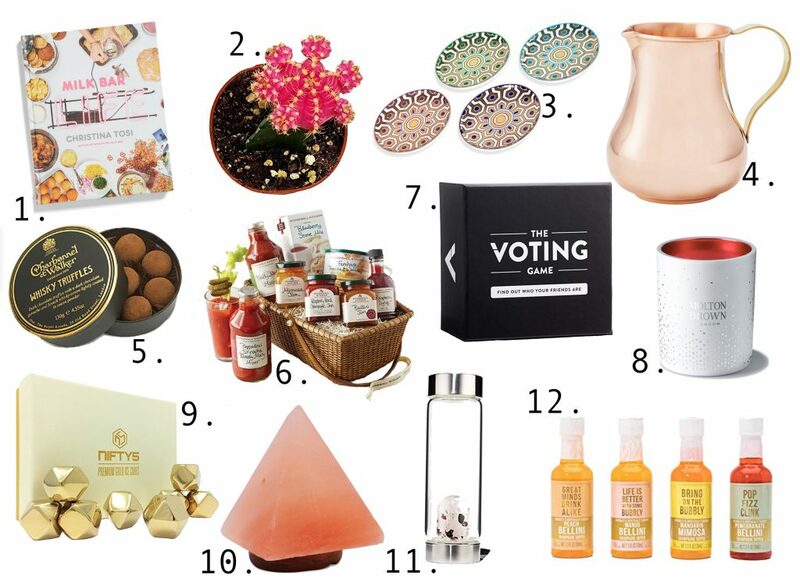 Next Post: Holiday 2018 Gift Guide: Ideas For Everyone On Your List! 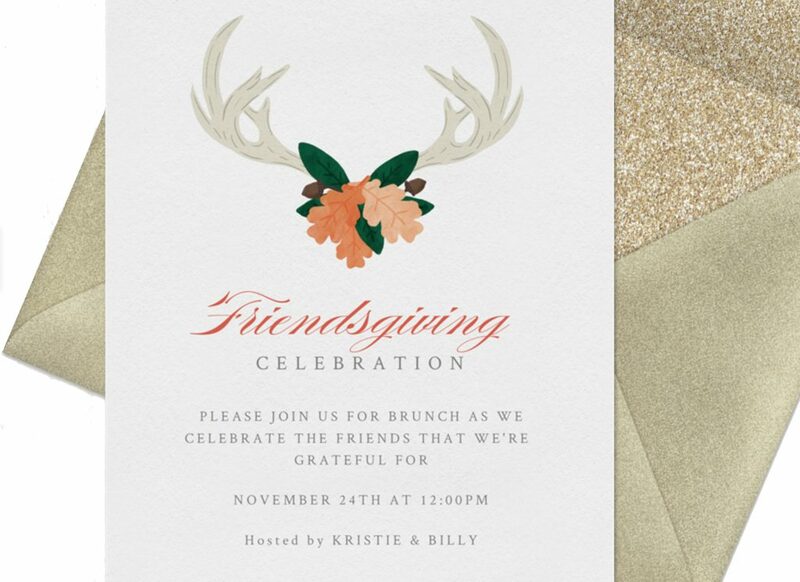 I don’t think I have heard of a Friendsgiving before. That is neat. Loved how you are detailed in this. Makes me feel ready to throw one! This is such a good post! I love how you go or to eat for thanksgiving. I’m so non traditional and I’m not into all the cooking but I’ve never done a Friendsgiving and I think it would be lots of fun!